The cost of Spring certification has also reduced from whopping 3200 US Dollars to just 200 US dollars because of no mandatory training. Ever since this announcement is made by Pivotal, I have received a lot of queries from my readers, who have mainly experienced Java developer looking to get Spring certification. In this post, I have collated and compiled their queries and put together for everyone's benefit. If you are preparing for Spring certification and have any doubt regarding the exam, process, cost, syllabus, resources then you will find some good information here. If you have a question which is not answered here then you can also drop a comment and I'll try to find an answer for you. Here are some of the frequently asked questions about Spring certifications e.g. Pivotal Certified Spring Professional Certification Exam, Spring Web Application Developer exam, and Spring Enterprise Integration Specialist exam. These questions touch many areas e.g. eligibility, cost, how to prepare well, resources, books, mock exams, types of questions, the difficulty of questions and where you can find Spring certification dumps to get an idea of what is asked in the actual exam. Most of these questions are the collection of what my readers regularly ask me over email, Facebook chat and other mediums and should answer many of your questions and doubts, but, if you have a question which is not answered in this list then feel free to drop a comment and I'll try my best to answer your question. What is the cost of Spring certification? This is one of the most frequently asked questions about Spring certification. The cost of Spring certification voucher is 200 USD. The cost is same for all exams e.g. Spring Professional Certification, Spring Web Application Developer Exam, and Spring Enterprise Integration Specialist exam. See here to learn more about the cost of various spring certifications around the world. What is the cost of Spring Framework training? The cost of Spring training e.g. Spring Core or Spring Web is around 3200 USD or equivalent in local currency on the USA, Europe, and other North American countries, but the cost of Spring training in India is just around 50K INR for 4-day classroom training from SpringPeople. Can you take the Spring framework training online? Yes, Pivotal and its partner e.g. SpringPeople provides both classroom and online training. Is it possible to take Spring Certification without training? Earlier, the Spring training provided by Pivotal and its partner e.g. SpringPeople in India was mandatory for appearing in Spring Certification but from 10th May 2017 Pivotal has lifted that requirement (see here). Now, the training is optional and if you can afford then only you need to enroll. Similar to Java certifications you can directly buy exam voucher and appear in Spring certification without any training from Pivotal or its partners. Which version of Spring certification should you give? In Pivotal's website, the Spring professional certification is available for both Spring 4.2 and Spring 4.3 but I suggest you give the latest one. Since Spring 5.0 is also live now, I expect that Spring 5.0 certification will also be added soon, but, if you are in hurry, better give Spring v4.3 exam. What is Spring Certification Path? Pivotal provides three main Spring certifications, the Spring Professional Certification Exam, the Spring Web Application Developer Certification, and Enterprise Spring Integration Specialist. The first one is the pre-requisite for other two. Here is the diagram which explains the Spring certification path clearly. Can you retake the exam after failure? Yes, you can retake the Spring certification exam after 14 days of the cooling period, but you need to buy a separate exam voucher worth 200 USD. There is no discount on retakes. So, it's best to try and pass the exam in the first attempt. What are some good books for Spring framework Certification? Depending upon which Spring certification exam you are preparing, here are some of the good books for them. These books are enough to pass respective Spring certifications, but if you want to prepare in more detail, I also suggest you check some of the free online courses as well e.g. 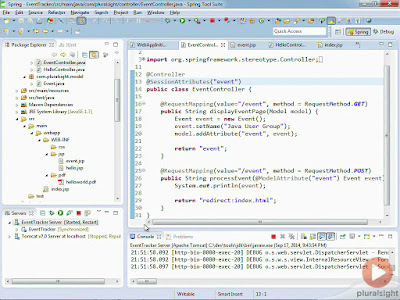 Spring Framework MasterClass and Introduction to Spring MVC from Pluralsight. Does REST and Web Services are covered in Spring Core Certification? As per official Spring Study guide, v4.2/v4.3 is definitely part of Spring core Certification. Apart from that, you can even expect some questions from Microservices, but the weight of REST is not much, hence 2 to 3 questions is maximum you can expect. Why become a Certified Spring Developer? Well, a Certification gives you the recognition and sets you apart from the competition. It will also help you to learn the Spring framework better which will eventually help you in your job and career. Once you complete the certification you will feel more confident in job interviews. Some companies also encourage their employees to become certified so that they can present good picture to their client. Many fortune 500 companies like to see certified developers handling their systems and process. The best way to prepare for Spring certification is to take the Pivotal's core Spring training because most of the questions are from the study material provided by 4-day course, but that's not the only way. You can still pass Spring certification with a good score without training. All you need is a couple of good books, tutorials, and mock exams and 2 months time. If you are preparing for Spring Professional exam, you can buy a good study guide like Pivotal Certified Professional Spring Developer Exam: A Study Guide and take some free online courses on Spring and Spring MVC framework e.g. Spring Fundamentals and Java Spring Framework 4 and Spring Certification from Pluralsight and Udemy. Once you feel comfortable with the Spring and can answer all questions given in the official study guide, you can take a good Spring certification simulator e.g. David Mayer's Core Spring simulator. If you consistently score 80% on this exam, you are good to go. What are some free Spring Core Professional Certification Mock Questions and PDF? These sample questions will give you some idea of what to expect in the real Spring certification exam, but, the general rule is that Spring certification focus on concept rather than how to and remembering class and interface names. What are some good mock exams for Spring Certifications? At the moment there are not many good mock exams available for Spring Certification but the one which stands out is David Mayer's Spring Web Simulator. It has been updated for Spring v4.2 and v4.3 contains more than 450 questions on different exam topics e.g. Container, testing, Spring MVC, Spring Security etc. You can also access the simulator online from anywhere. It also provides a free PDF with sample question, which you can use to assess the quality of question before buying the full simulator. 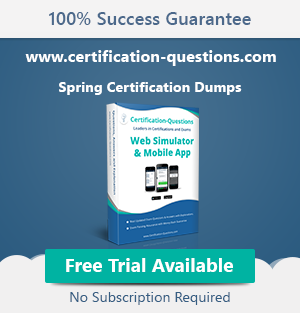 That's all about some of the frequently asked questions about Spring framework certifications. Now that Pivotal has removed the mandatory training requirement, it's a very good opportunity for Java and Spring developers to get recognition for their experience in Spring framework. Apart from recognition, you will also learn a lot about some advanced features of Spring framework e.g. Spring with REST and Spring Security, which will also help you during a Job interview and eventually help you to get a better job with better salary.